Contributed by Michael Moore, STOC #2636. I bought a ST 1300 a couple of months ago, and the one gadget I missed the most on the new 1300 was the Middleton Handbrake that I have had on my ST 1100 for the past 10 years. For those of you who didn't have an ST during the last century, the Middleton Handbrake was a clever little bit of stainless steel origami that allowed the rider to set the front brake to remain on. The park brake released automatically when the front brake lever was pulled in a bit further. 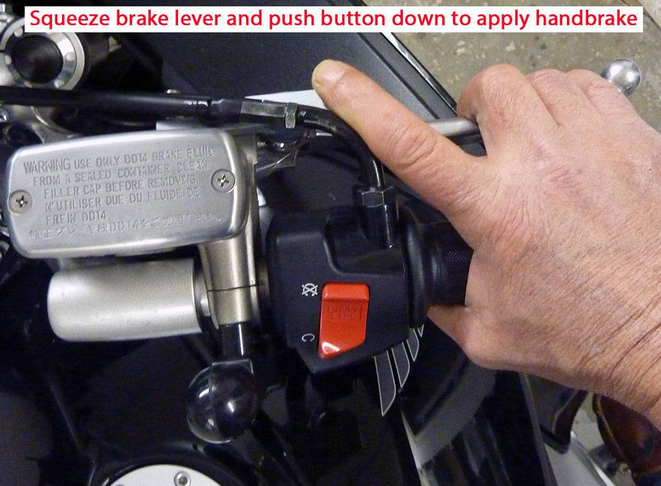 It worked by putting a small tang in behind the brake lever when the brake lever was applied and the handbrake lever was moved up by the rider's thumb or forefinger. Clever and elegant engineering at its best. With the handbrake fitted on your ST 1100, you could set it with a flick of the finger when at a stoplight, or parked at the side of the road looking at a map, or in any other situation where you didn't want the moto to roll in either direction, but wanted to be able to take your hand (and foot) off the brake lever. I used it constantly. Mr. Middleton ran (runs?) a stainless steel shop in the UK. My guess is that he also rode a ST 1100, and developed this little goodie on his own. Unfortunately, it seems that he never bought a ST 1300 (and probably sold his ST 1100), because the original ST 1100 handbrake is now out of production, and there never was a handbrake made for the ST 1300. ...until Tony Worrall came along. Tony (whom I am going to guess is a ST 1300 owner) has designed and is currently manufacturing and shipping handbrake kits for the ST 1300. I ordered a kit from him a couple of weeks ago, and when it arrived by post, I installed it on my ST 1300. 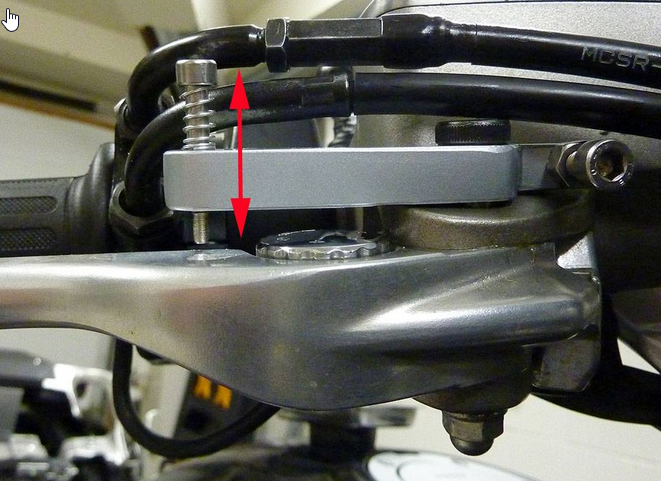 Only the handbrake lever (top part) and the replacement brake lever bolt are actually installed on the ST 1300. The drill bit, flat piece of metal with the two holes, the nut and the washers are used during the installation process, and discarded afterwards. The shape of the ST 1300 brake lever and the placement of the throttle cables is such that the original Middleton design cannot be used on the ST 1300. There's not enough space available - the throttle cables are in the way. 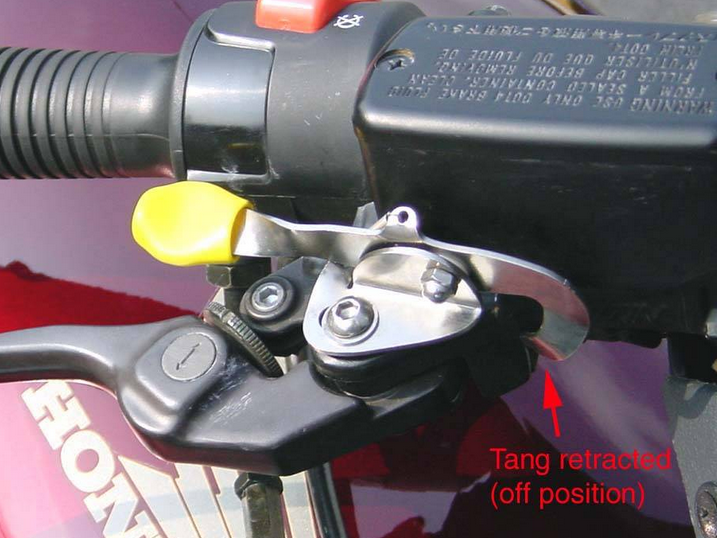 Additionally, the inboard end of the brake lever is a little different on the 1300, and doesn't present an easy opportunity to slide a tang into place to keep the brake applied. Tony has followed a different path designing his handbrake. 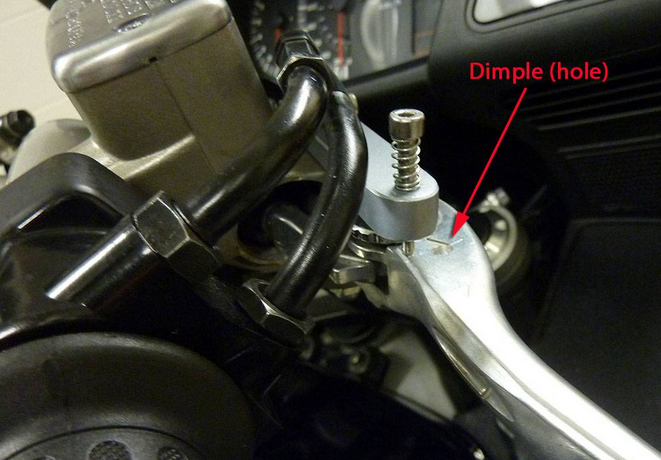 Instead of attempting to keep the front brake applied by sticking something into the far inboard end of the brake lever, he's designed a device that fits into a small dimple (hole) drilled into the top of the front handbrake lever. The general principle is the same, though: To use it, you squeeze the front brake lever in the normal way, then press down on the top of a spring-loaded pin that is captive in the end of a bar mounted above the brake lever. This inserts the pin into the hole in the top of the lever. The pin is spring-loaded to pop up out of the hole in the brake lever, and the hole is larger than the pin. Thus, any further squeezing of the brake lever once the parking brake is applied will cause the pin to pop up and the handbrake to release. It works well. Tony provides a complete set of illustrated instructions with the kit (the instructions are also available at his website, click here). I'm not going to attempt to duplicate his instructions here, but rather to provide a general overview of how the thing works, and what is involved in installing it. 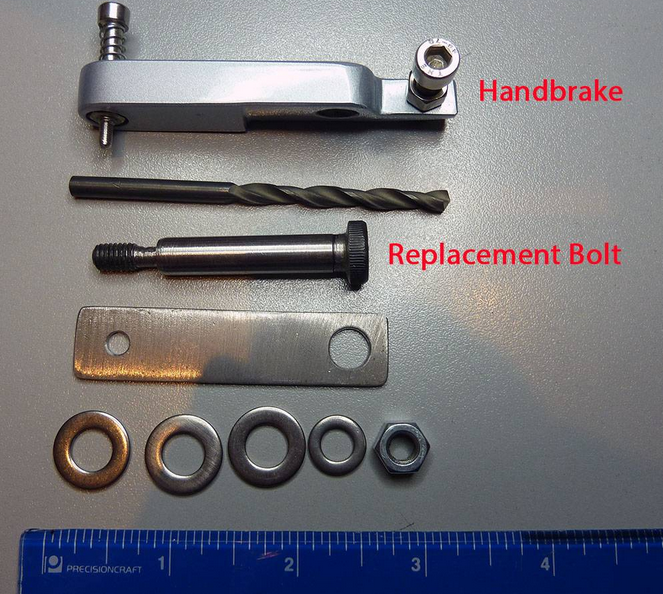 First, you remove the front brake lever, and using the existing Honda bolt and the washers, nut, and drilling template that Tony provides, you mount the drilling template onto the top of the handbrake lever. 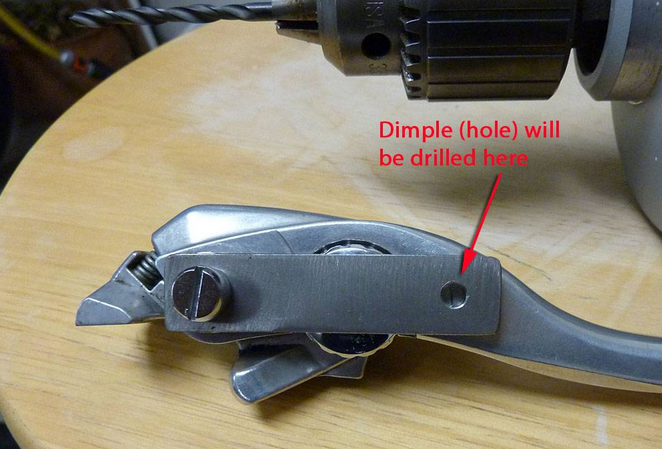 The smaller hole on on the drilling template, on the right side of the picture below, shows where the hole will be drilled in the handbrake lever. The hole will be drilled more or less at the outboard end of the arrow embossed on the lever. To release it, just slightly squeeze the brake lever in the normal manner, no need to touch the parking brake, it will pop up. I was a bit apprehensive about the idea of drilling a hole partway into the front brake lever. 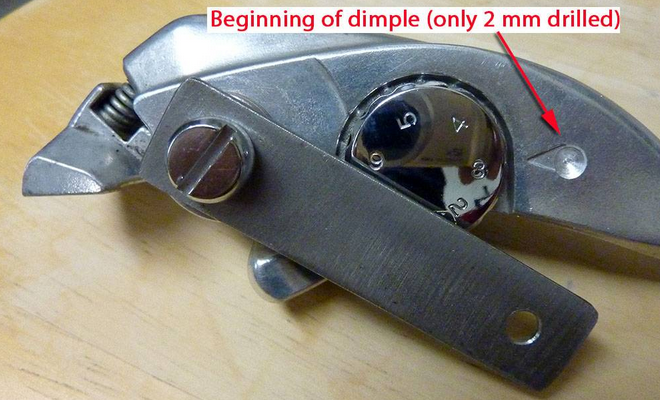 But, after thinking about it for a bit, I realized that the hole (a dimple, actually) is only 4 mm deep, and the handbrake lever is 18 mm thick at the point where the hole gets placed. Besides, Honda has already drilled a much larger hole completely through the handbrake lever casting - up where it pivots to apply the brake (where the bolt goes) - and I have heard no reports of the casting breaking where Honda put their hole. I was also kind of apprehensive about my limited skill drilling holes in metal, but the task was made pretty simple by the template and drill bit that Tony provides. The only thing I had to pay attention to was making sure I did not drill any deeper than the 4 to 6 mm specified (final depth of my hole was 4.5 mm). All told, it took about 30 minutes to carry out this installation, and 10 minutes of that time was fetching the drill and then putting the drill away. The Pendle Parking Brake for the ST 1300 works as well as the original Middleton design for the ST 1100. I'm very happy with it, and recommend it without reservation to others. Be aware that it is only intended to be used when the rider is astride the motorcycle - in other words, if you want to park your bike on a hill using the side-stand, you put the engine in gear as you normally would. 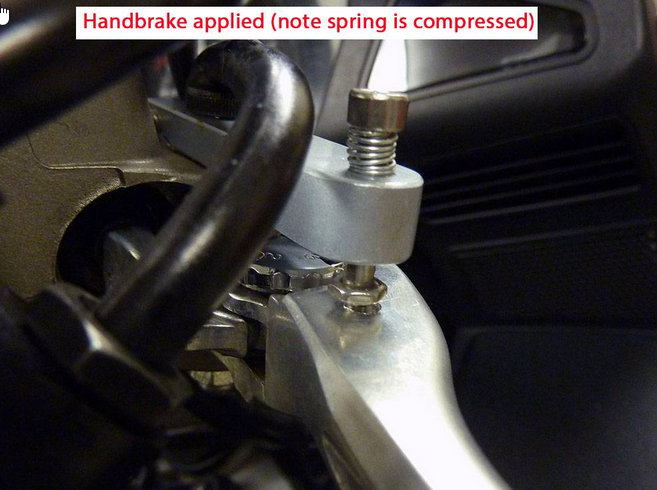 This handbrake would hold the moto parked on a hill, but if anyone bumps the front brake lever, the handbrake will instantly release, as it is designed to do. The only addition I would make to the otherwise excellent instructions that Tony provides with the kit is to suggest that after installing everything, you apply a little bit of oil to the spring-loaded pin that goes up and down, to ensure that it extends and retracts easily and without any friction. It would be nice if the button on top of the spring-loaded pin was bigger... I'm going to keep my eyes open for something that I can put over it to provide a larger surface to push on. But, there is no problem operating the pin as it is now. Tony sells these parking brakes on eBay for ₤30 ( about $50 US Dollars), shipping included. You'll have to go on eBay and search for "Pendle Parking Brake" to find it. His website, which contains information and installation instructions, is here. I believe that he sells a similar device for the ST 1100, but I am not familiar with that device. Ooops, I forgot to mention that the amount of pressure that the handbrake exerts when applied can be adjusted using a small set-screw at the inboard end of the lever. Because this facility for adjustment is provided, fore and aft placement of the hole (when drilling it) is not critical. I chose to try and center the hole front to back in the brake lever, I think that position minimizes the risk of any cracks propagating in the casting as a result of the hole being drilled. 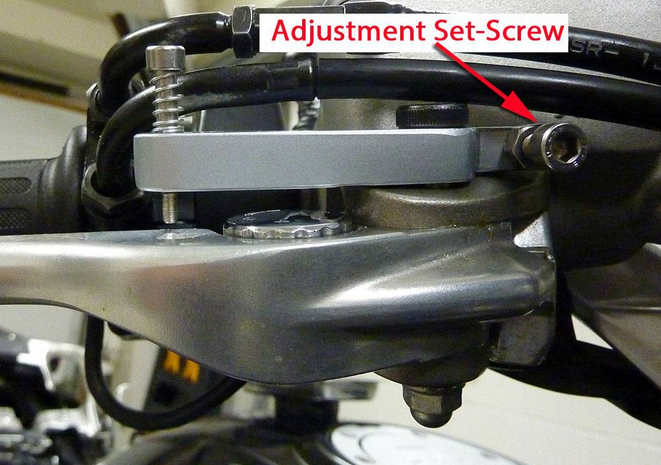 The adjustment set-screw allows for brake lever position to be changed using the chrome dial on the brake lever without any loss of efficiency of the parking brake. Comments by Scott Chaisson, STOC #8642: It's important to note that you should adjust the brake first, before you drill. The hole changes when the brake is adjusted. At least, that's the way it seems to me on my bike. I've had it for ~2 years now. Works very well.